On 15 April 1969, an American EC-121M Warning Star Naval reconnaissance aircraft was shot down over the Sea of Japan by a North Korean fighter jet. The Korean peninsula had remained an area of tension between the United States and local Communist powers since the armistice signing that concluded the Korean War in 1953. American policymakers were at a crossroad of calculated military response or diplomatic measures as the legitimate means of retaliation. 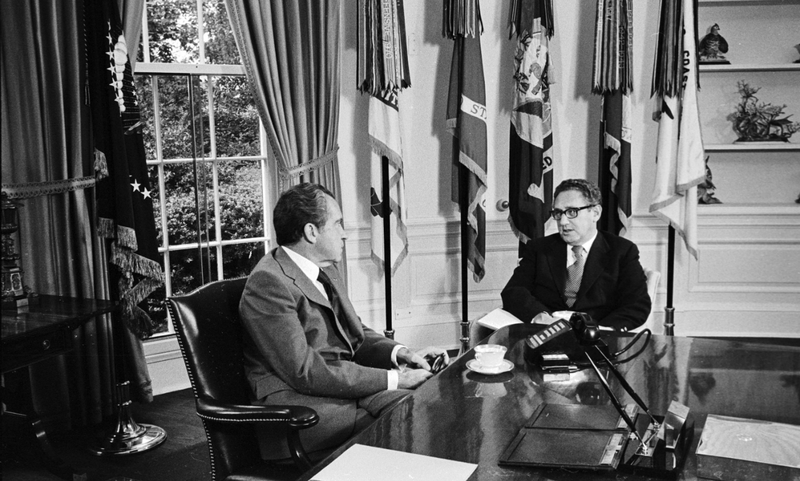 National Security Advisor Henry Kissinger composed and recounted a list of talking points to advise President Nixon for the corresponding National Security Council meeting. At the recommendation of the Korean Review Group, the incident was not to be treated as action reflecting a broader trend aggression by the larger hostile states in the region, but a sole act by North Korean leadership. On a timeline, the Nixon administration felt compelled to respond to the DPRK’s offer to convene in the Korean negotiation camp of Panmunjom in a timely manner. Below, the Kissinger NSC talking points memorandum for 16 April 1969 is an illuminating look at the corridors of presidential decision making with regards to foreign policy. The administration eventually decided on a showcase of strength through a series of military exercises in the Sea of Japan – thereafter continuing to use the same airspace to fly reconnaissance missions.